Rectangle – A parallelogram with four angles of equal size (right angles). Two pairs of opposite sides are parallel (by definition). and the leading factor 2 comes from the fact that the chosen diagonal divides the parallelogram into two congruent triangles. 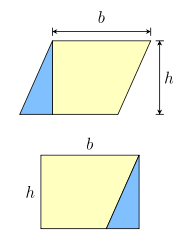 Parallelograms can tile the plane by translation. If edges are equal, or angles are right, the symmetry of the lattice is higher. These represent the four Bravais lattices in 2 dimensions. ^ "CIMT - Page no longer available at Plymouth University servers" (PDF). www.cimt.plymouth.ac.uk. Archived from the original (PDF) on 2014-05-14. ^ Owen Byer, Felix Lazebnik and Deirdre Smeltzer, Methods for Euclidean Geometry, Mathematical Association of America, 2010, pp. 51-52. ^ Zalman Usiskin and Jennifer Griffin, "The Classification of Quadrilaterals. A Study of Definition", Information Age Publishing, 2008, p. 22. ^ Chen, Zhibo, and Liang, Tian. "The converse of Viviani's theorem", The College Mathematics Journal 37(5), 2006, pp. 390–391. ^ Problem 5, 2006 British Mathematical Olympiad, . ^ Dunn, J.A., and J.E. Pretty, "Halving a triangle", Mathematical Gazette 56, May 1972, p. 105. ^ Weisstein, Eric W. "Triangle Circumscribing". Wolfram Math World. ^ Mitchell, Douglas W., "The area of a quadrilateral", Mathematical Gazette, July 2009.